While Jewish majority has declined since reunification of Jerusalem in 1967, data suggests that trend may be reversing itself. Despite a high fertility rate and the relatively high proportion of new immigrants who settle in the city, Jerusalem’s Jewish majority has been in decline for decades. While Jews made up 72% of the city in 1990, the number fell to 68% in 2000 and just 62% in 2014. The decline has been fueled not by differences in birthrates, but by internal immigration, as Jewish residents leave the city seeking cheaper housing and better job opportunities. In spite of the city’s relatively robust Jewish fertility rate of 4.3 children per woman, compared to an average fertility rate of 3.3 among Arab women, the Jewish majority has declined as the exodus from Israel’s capital accelerated during the 1990s and 2000s. But according to data released by the Jerusalem Institute for Israel studies on Tuesday, that long-standing trend is beginning to reverse itself. 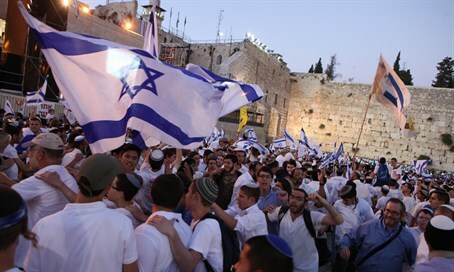 The two populations, finds the Jerusalem Institute report, are trending in opposite directions, with Arab birthrates and overall growth rates declining as Jewish birthrates and overall growth rates rise. For the first time on record, in 2014 the Jewish natural growth rate – the number of live births minus the number of deaths – surpassed the Arab natural growth rate, with a net-growth of 23.7 per 1,000 Jewish residents, compared to an Arab growth rate of 23.4 per 1,000 residents. In addition, the overall growth rate of Jews has increased. While in 1994 the total Jewish population of Jerusalem increased by only 1.7% annually, in 2014 that figure stood at 2.2%. The Arab growth rate, by comparison, has declined in the same period from 3.1% annual growth to 2.7%. While Arab growth exceeded Jewish growth by 1.4% in 1994, that figure had been cut by nearly two-thirds to 0.5% by 2014.